Back in 1996-1997 I lived off Merrion Square in Dublin and took a route up Westland Row to Fenian Street to get to my apartment from school. 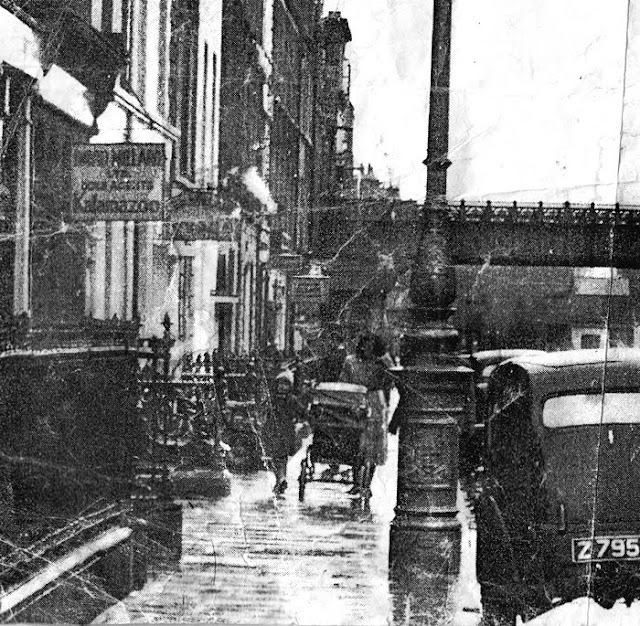 After I read Ulysses I took particular interest in Bloom's route in Lotus Eaters, where he heads up Westland Row to Sweny's chemists for a bar of lemon soap (the pharmacy was still selling lemon soap to dork tourists nearly a century later). I went to the national library to look up old photographs of the street, and I found this one that looks like it was from the mid to late 1940s. 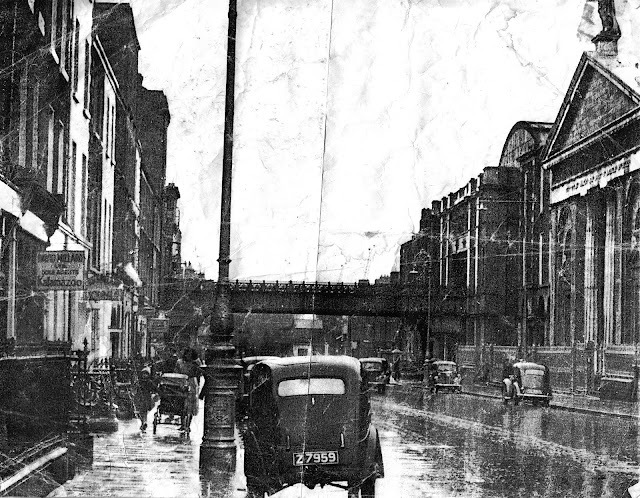 That's the commuter rail track (now used by DART) to the Pearse Street station, and the Church of St. Andrew on the right. I'm sure an old ad man like Leopold Bloom would approve. I was able to enlarge the photo on the library's photocopier (and felt lucky to be allowed to do so) and I kept the photocopy among my treasured things for a long time. After losing track of it years ago, I just found it again, stuffed between the pages of a book and I spent the last few days googling to see if there was any information about it now on the Internet, but still my trail ran cold. I sort of like that it's still a mystery, even if it feels less cosmic to me now. When my wife (then my girlfriend) moved to Dublin from Kalamazoo later that year, she took an apartment across the street from that sign. Spending the last few days poking around photo archives of Dublin made me miss our time there back when we were kids, and a part of me wants to go back to see all that's changed. This being Bloomsday, I also have to link to the amazing project slowly revealing itself over at Ulysses Seen, Throwaway Horse's comic-book style version of James Joyce's great novel. Right now the only chapter available is the first, and I really look forward to see how the editors/artists handle some of the later chapters. Cyclops? Circe? 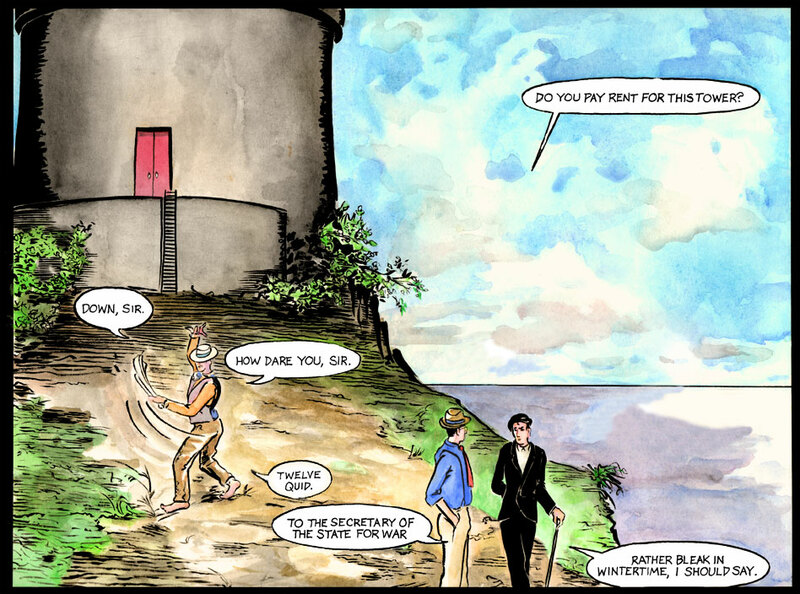 Here is an illustration of Stephen, Buck, and Hained at the Martello Tower from Telemachus. Ulysses Seen is a great way to revisit the novel and the product of a lot of thought and hard work. I hope they have the fortitude to see the project through to completion (it really would have helped me back when I was a student glancing back and forth between the text and annotations). If you've ever struggled with the novel, this is a great way to help visualize what's happening in the sometimes hopelessly inscrutable text.